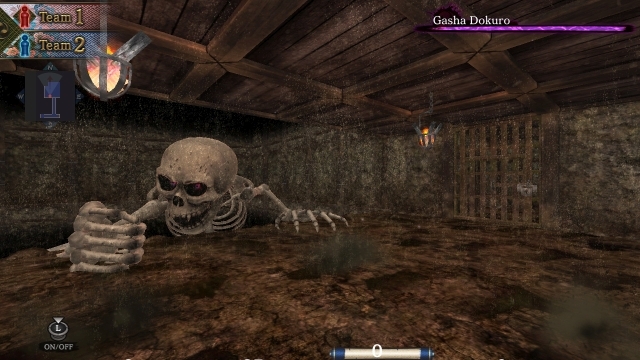 Hyakki Castle is one of my favourite dungeon crawlers in recent years. It plays much like a modern western dungeon crawler (think Legend of Grimrock rather than Wizardry), but has an unmistakably Japanese aesthetic, theme, and tone. It's an eclectic blend, to be sure, but it worked on PC when it originally released last year, and it's even more appealing on a handheld console. There's not much to say regarding the game's themes that I haven't already covered in my original review (so please have a read of it for greater context). 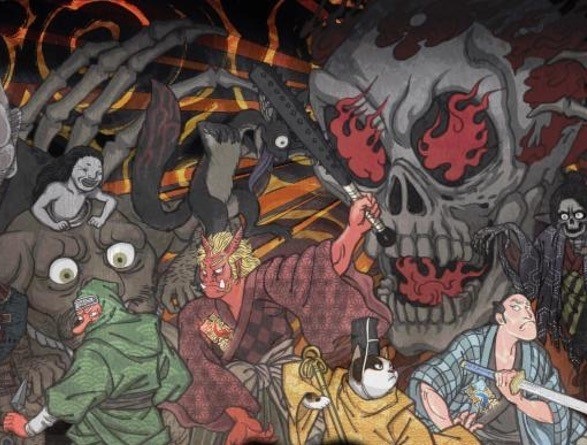 Hyakki Castle takes the many eldritch horrors of Japanese yokai mythology, and throws them at players in a gauntlet of a dungeon crawler that is light on storytelling, but rich in theme. The more you know of yokai and the stories behind them, the more you'll get out of Hyakki Castle, because each and every one of them has a story behind them, though for the most part you'll need to go research those stories for yourself. I'd be surprised if, after playing this game, you're not inspired to at least go out and learn a bit more about yokai in a general sense. Hyakki Castle's monsters set such a great tone for a crumbling labyrinth of horror because the designs are so twisted and hideous. With each new dungeon level you're guaranteed to square off against some new beasts, and one of the greatest incentives for playing on is just to see what creatures will be thrown at you next. The other thing I love about Hyakki Castle is how seasonal it feels. Ghost stories - and particularly haunted houses - are a big part of the Japanese summer aesthetic. As the idea goes, the chills that ghosts and haunted houses bring are a remedy to the stifling and humid Japanese summer heat, so a game like this, which plays to both the haunted house and the traditional "chill" monster stories of old, is in an odd way like setting a game at the beach in Australia; it simply "feels" like summer. It further helps to ground the game as something familiar and sitting here in Australia, coming off a pretty chilly winter, it's nice to almost hear the cicadas that dominate Japan's summer soundscape as I play this game. Combat itself is standard for the western dungeon crawler genre. Dungeon levels are broken up into "squares", where each movement takes your group of four heroes to a new square - much as it happens in the popular Wizardry clone dungeon crawlers in Japan. While the exploration will feel turn-based, the combat itself plays out in real time. An enemy will make an attack, take a few moments, and then launch another attack. Your job is to figure out how to defeat those enemies without taking too much damage in return. For more basic enemies you'll just need to duck out of the way when an enemy starts an attack animation, before ducking back in and getting a couple of attacks of your own in in return. More complex enemies have ranged or magical attacks that require a slightly different approach. And then there are a couple of enemies that require you use a mechanic close to unique to Hyakki Castle; the ability to split your party in two. So for example, you could leave two of your best fighters in a defensive position, while using your hard hitting rogue and magic user to sneak around behind the enemy and hit it in the back for extra damage. This mechanic is a really neat idea, and is also sometimes needed to solve some of the game's puzzles (for example, splitting the party so you can "stand" on two switches at the same time). Unfortunately the mechanic isn't required anywhere near as frequently as would have been ideal. Being able to deal with threats by cutting the strength of each team in half is such a neat idea for heightening tension and adding risk/reward to the strategic mix, but it seems like the developer really struggled to find interesting ways to encourage players make use of it. For the most part, you'll get through the game just fine by keeping the team together. The main point I'd like to make in this review, however, is just how superior the Nintendo Switch version is. Dungeon crawlers do so much better as handheld experiences, for a start. Because they don't tend to be processor-heavy, they can remain as visually impressive on a smaller screen, and the lower intensity of pace makes for a more cerebral, relaxing kind of gameplay, which works when you need to unwind with your console in bed or on the train after a long day's work. More importantly, though, Hyakki Castle had a truly painful interface design when playing on the PC with a mouse and keyboard, particularly with regards to inventory and character management. On the Switch the interface all makes a lot more sense and I never felt like I was struggling more with the game than the monsters that it was throwing at me. Hyakki Castle puts up a welcome challenge and offers players something rooted in a very authentic Japanese (Shinto) spirituality. It's an artifact of the country and comes from the same place that the likes of Okami, Nioh and God Wars does. It's truly amazing that the Nintendo Switch has had three of those four released on it in the span of just a couple of weeks.